Join High Desert Chamber Music for our annual Valentine’s Day concert in Downtown Bend on this special evening. 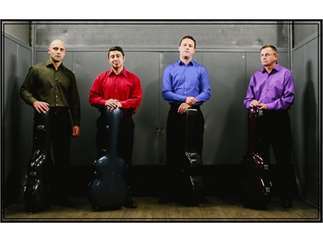 Enjoy a concert at the Tower Theatre featuring the Oregon Guitar Quartet, making their debut in the HDCM Concert Series. This best-selling evening includes a complimentary rose for concert-goers and a custom treat from Goody’s Chocolates!